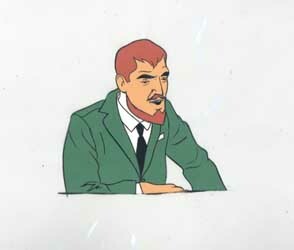 Also, here's a link to a slightly different cel from the same scene; note the slightly different expression on Dr. Quest's face. (Courtesy of Van Eaton Galleries). Hand-inked and hand-painted production cel of Jonny Quest from the "Arctic Splashdown" episode on a hand-painted production background from the "The Shadow of the Condor" episode (see screen grab at right). Joe Tumminelli writes:"[T]he reason that a cel is sometimes placed on a background from a different episode is really a matter of marketing. Since cels from this series are hard to find, it is sometimes difficult in matching a cel with the same episode, especially when only one dealer's inventory is involved. Therefore, when a dealer finds a background, he has two choices; he can either try to sell it on its own (not always easy if the background is not too exciting, as in this case), or he can use it as the background to a cel he has in inventory, thereby increasing the cel's perceived value, and thus its price. In other words, the whole is worth more than the sum of the parts." 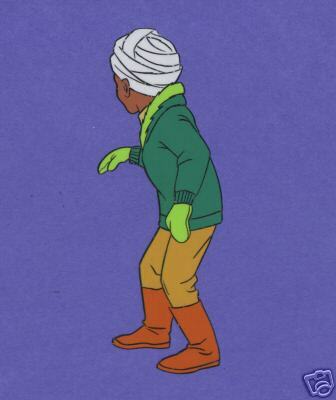 Here are similar cels of Hadji in this episode. 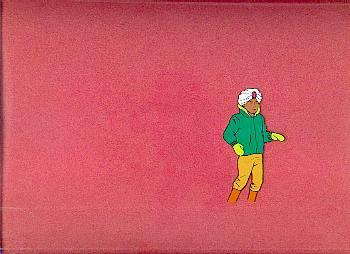 This cel is from the scene where the diver attempting to eliminate Dr. Quest has returned to his raft after failing with the dart gun (see screen grab at right). His next attempt with a grenade will go even less well. The submariner listens intently to his captains orders. This cel is from the scene where the crew of the enemy sub following the Quest expedition is making plans to torpedo the Quest's ship.